← haven’t you ever seen a pink shirt before? 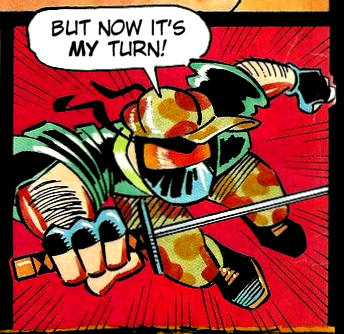 This release includes both the main comic from this issue as well as a few semi-related pages of the magazine, including an additional 1-page Captain Ninja comic about MK II. I have a lot of people I want to thank for their help for this release. The translation has been brought to you by the efforts of grungethemovie who will hopefully be joining us for some more Captain Ninja soon. He even made the bonus page this time. Also would like to thank wilddiverse from the Technodrome forums for pointing us to the scans, and http://www.datacassete.com.br/ for scanning them. And finally we also got a little outside help on this one that was quite appreciated. Hopefully more Captain coming in the near-ish future! This entry was posted in Captain Ninja, Teenage Mutant Ninja Turtles and tagged captain_ninja, pt-BR, TMNT. Bookmark the permalink.